Wing: Brown calf or pheasant rump or both. If using both, tie in one material followed by the thorax followed by the second material. Another option is to top the wing(s) with mallard flank. Thorax: Rabbit fur dubbing, applied loosely with a dubbing loop and stroked backwards. 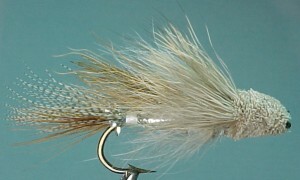 I first thought of this pattern while fishing a standard muddler for landlocked salmon one day in early July. In the past, while fishing for trout, I had wondered why I would frequently notice trout swimming up to a standard muddler only to get a bird's eye view and reject the fly. That day in early July, I decided that a muddler with less shine in the body would be just the thing. I decided that a fur thorax or rabbit fur would accomplish this. An evening on the "Punch Bowl" proved to me that this muddler variation was a success. The "Punch Bowl", as it is known by the locals who fish it, is a 45-minute bike ride (30 minutes uphill!) from where I live. The fish that inhabit the Bowl are immensely fat, due to a prolific damsel nymph population. I fish this pond every summer, as it is known to produce brookies over 4 pounds. Catching them is something of a task, and oddly enough only a few fishers are aware of its existence. As far as brookies go, I have never witnessed any behaviour similar to these fish anywhere on the Island. These fish can usually be taken only after the sun goes down, and an east to northeast wind with lots of fog brings out the biggest fish… strangest behaviour I have ever seen in Brook Trout. They can usually be caught any time, day or place here on the "Rock", but not this particular strain. I catch between one and three on a good night, but on many nights I catch none. A good day on any other pond on the island, depending on the time fishing, would result in catch of 12 to 30. In a stream or creek, catching 40 plus is no problem if you're willing to move around. I had arrived at the "Bowl" about 10 minutes before sundown. The wind was wicked and the fog was thick. Getting my 5 wt. line on the water was a chore. I had just made my third cast and BAM. At first I assumed my usual fat and stout 14- to 16-incher. So, I started to strip the line, except TUG. This fish was not like the rest. In my estimation, this fish was at least 4 pounds. I say estimation because I never did land it. I had only fought it for about (honestly) 40 seconds when it wrapped the 3X tippet around a submerged stump, paused for a moment, and ripped my muddler from its mouth. I had lost the fish. But I also lost the muddler, because almost simultaneously with the trout throwing the fly, the tippet snapped as my pulling motion caused the hook to lodge in that darn stump. Through the clear water, I watched in amazement as the brookie paused momentarily before finally darting off into the depths. I have never seen a trout this large in my life, brook trout that is. It was almost as fat as it was long. I can't wait to get back to the Bowl next year.